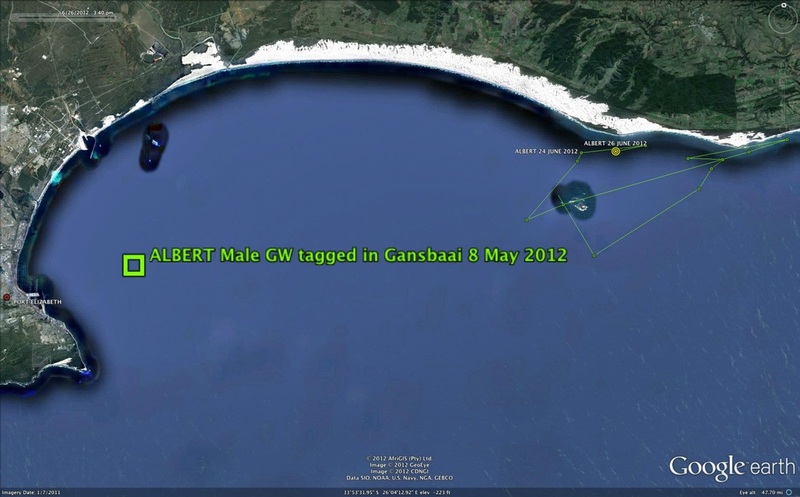 Having recently started to follow Ocearch’s daily posting of the Algoa Bay Shark tracks, I decided to follow up with local shark expert Matt Dicken as to the latest findings of the Algoa Bay White shark tagging project. A bit of background in case you haven’t read the previous article on the project (click here) – through sponsorship from the Metro Matt and his team have set up 19 listening stations throughout the bay, have tagged 6 whites, and have funding to tag a further 35. The Ocearch guys came into the picture earlier this year. They’re the Shark Men from the Discovery Channel and came to SA for a full-on tagging expedition. They hit the news for all the wrong reasons when there was an unfortunate fatal shark attack in Koeel Baai a few days after their tagging visit to False Bay. The public’s knee-jerk reaction was to point fingers at them for causing the attack. But Scientists all agreed there was absolutely no connection whatsoever, just a horrible coincidence. The Ocearch team hooked up with all the existing White Shark projects in SA (False Bay, Gansbaai, Mossel Bay and PE), visiting each location to tag sharks with both acoustic and satellite tags. In total 39 Whites ranging from between 2.5 – 5m were tagged with internal tags. These have a 10 year lifespan. 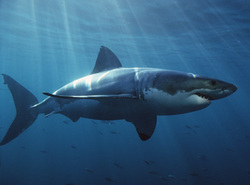 80% of the sharks were also fitted with satellite tags, although these last only 1-2 years. It’s these satellite tags that are currently giving the data to produce the daily shark track photo’s released by Ocearch. The Algoa Bay listening stations were pulled up for data collection for the first time in May this year – at which stage the Ocearch tagged sharks had only been transmitting data for a month (the project having been completed in April). In total 6 tagged sharks were picked up by the receivers. 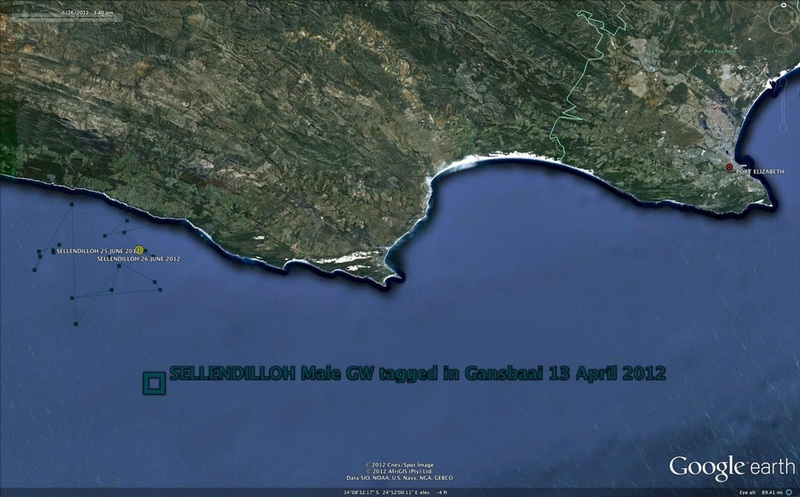 A single tagged shark was picked up as having moved quickly along the backline from Cape Recife, past Something Good, Hobie and Kings Beach, then on towards Sundays. The other sharks were all picked up at Sundays and around Bird Island – which is where they’re expected to be this time of year. 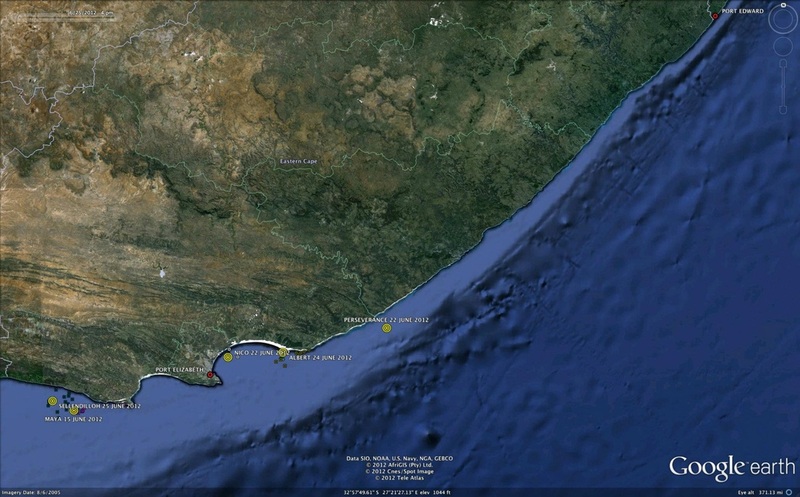 The next listening station retrieval at the end of this year should reveal considerably more tracking data now that there’re at least 45 tagged sharks in total along the SA coastline. Matt plans to continue tagging on their monthly visits out to Bird Island – where he hopes to tag about 5-6 sharks a trip. The more tagged sharks that get monitored, the better the information the scientists will have to work with. Hopefully it means a progression from assumptions and theories regarding shark behaviour and movement to actual empirical evidence. Matt reckons the real valuable data will be garnered about 4 years’ from now, when all the tagged sharks have been monitored over a sufficiently long time period. Hopefully then we’ll have a picture about when Mr White like to be in certain places, and why.